Deaf Centre Manitoba Inc.: DC Cafe Fish Fridays available on Fridays only!! Every Friday we will be having a fish and chip special that will run 12:00 pm to 5:30 pm! 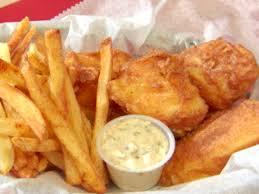 This includes an 8.5 oz piece of golden ale beer battered fish and fries with lemon wedge and tarter sauce!